March marks the anniversary of the most recent eruption of Mauna Loa, which began on March 25, 1984. It also reminds us of a much more destructive series of events that affected the Island of Hawai‘i—the 16 days of earthquakes in 1868 that included a tsunami, landslide, and eruption in the District of Ka‘ū. As with many Mauna Loa eruptions, unusual activity was first observed at Moku‘āweoweo, the volcano’s summit caldera. On Friday morning, March 27, 1868, people from Kawaihae to South Kona saw a column of smoke rising from the summit. Pele’s hair (lava filaments) carried on the wind, confirmed a volcanic source of the smoke. That evening, numerous earthquakes occurred, culminating in a strong and damaging earthquake early Saturday afternoon, March 28. By modern measure, this earthquake is estimated to have been about magnitude 7. The earthquakes, which continued for days, were frequent and severe in Kona, Ka‘ū, and Hilo. 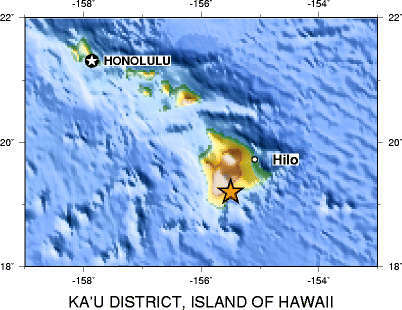 Between 50 and 300 quakes were felt each day, with the most reported from Ka‘ū. In some areas, it was described as nearly continuous ground motion. The seismic activity came to a head on Thursday afternoon, April 2, when a violent earthquake (at least magnitude-7.9) rattled the island and beyond. Located beneath South Hawai‘i, the quake was felt as far away as Kaua‘i and stopped clocks on O‘ahu. 1868 Quake epicenter in Ka‘u district. In Ka‘ū, the destruction was nearly complete. People who had been standing or on horseback were knocked to the ground. Those sitting on the ground had to brace themselves with their hands and feet to remain upright as the powerful shaking went on for several minutes. All stone structures—buildings and walls—were thrown down. The shaking caused several landslides in Ka‘ū, within Kīlauea caldera, in Hilo, and along the Hāmākua coast. The collapse of a cliff in Hilo caused one death, and a large mud slide in Wood Valley (north of Pāhala) buried 31 people in a matter of minutes. As the people of Ka‘ū were recovering from the earthquake, they noticed the ocean receding from the coastline. Over the next several hours, at least 8 waves washed ashore, razing coastal villages and carrying people and animals into the sea. 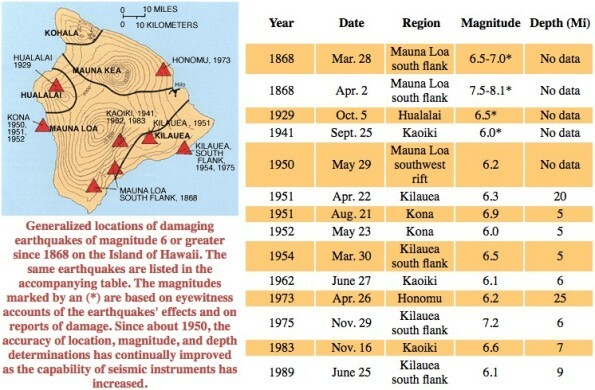 The tsunami, estimated to be more than 6 m (20 feet) high in Ka‘ū, caused damage from South Point (Kalae) to Cape Kumukahi (Kapoho), destroying more than 100 structures and taking 47 lives. The tsunami was detected several hours later on the west coast of the United States. But the devastation was not over. Strong earthquakes (aftershocks) continued to shake the island. On Tuesday evening, April 7, a fissure opened low on the Southwest Rift Zone of Mauna Loa, disgorging voluminous amounts of lava. The lava fountains jetted to heights of several hundred meters (yards) and produced lava flows that rushed southward to the sea (a distance of 13 km, or 8 miles) in 3.5 hours. The fountains also produced copious amounts of tephra that blanketed Ka‘ū with deposits of cinder and Pele’s hair several centimeters (inches) deep. Vog shrouded the islands of Hawai‘i, Maui, and O‘ahu. The lava flow was inactive by Saturday, April 11, and the earthquakes, though less frequent, were still occurring at a rate of 2–3 per day several months later. In fact, recent studies suggest that we are still recording aftershocks of the 1868 main shock! Using modern analysis, scientists have hypothesized that the southeastern part of the island, from Kapoho to Kalae, moved seaward and subsided several feet during the April 2, 1868, earthquake. At the time, American missionaries and Hawaiians alike said that there was no record of such devastating events in the history of these islands. But the geologic processes that caused the 1868 events continue to produce similar, less devastating, movements of the island’s southeast flank in the form of large earthquakes, such as the magnitude-7.7 Kalapana quake in 1975 and the steady seaward creep of Kīlauea’s south flank. HVO continues to track these movements and to study historical events, like the 1868 Ka‘ū earthquakes, landslides, tsunami, and eruption, for the clues they provide for our future.